Open Thread Thursday: What Did You Think Of RootsTech? Genea-Blogger, Thomas MacEntee, posted the following, and I thought that I would take a moment to respond. 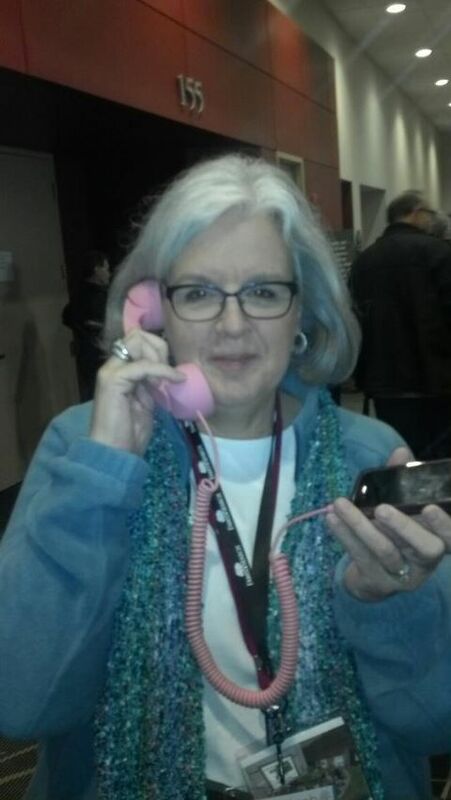 Last week’s RootsTech was an outstanding success on many levels based on blog posts, social media chatter and other feedback circulating on the Internets. 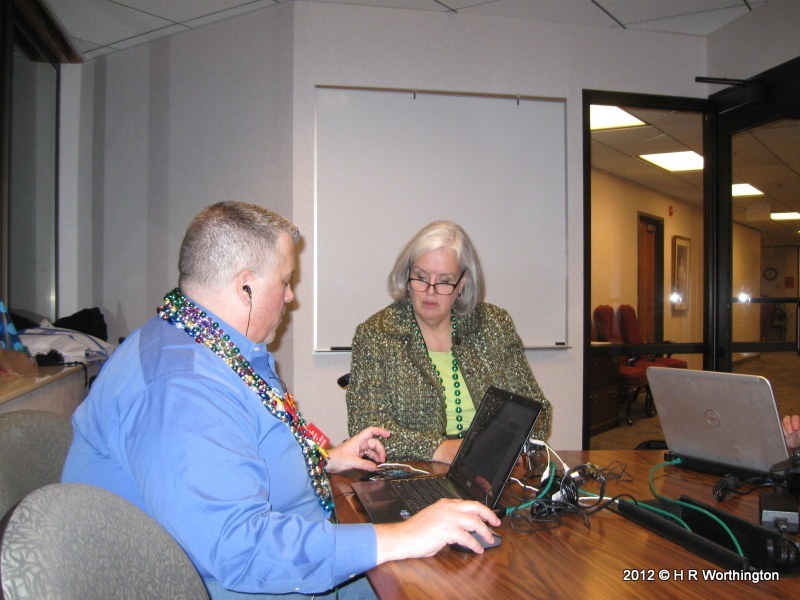 After staying home and watching RootsTech2011, three was no way that I was going to miss RootsTech2012. It was a great experience to be there, in person. The nice thing is, that I can still go back to view the Streaming Sessions that I missed while I was there. Still trying to catch up with them all. Looking back on this question, I thought that the Technical (Developer) side was too techie, and the User or Genealogy track was too basic. There were a couple of developer sessions that I wanted to attend, but they were at a much higher level then what I could learn from. I attended one Unconferencing session, on the developer / technical side and I was right, it was too high for me. The topic of the discussion was one thing, but the discussion strayed from the topic. The User Track was good, had lots of great presentations, but a number that I attended were a little too basic. Or more suited for a “normal” genealogy conference. I was hoping to see and be able to participate in the User / Developer discussions that is what THIS conference was all about. It was more of a show off of what “we” can do, rather then a discussion about would I would like to see, or asking of the question about what a User would want. On the flip side of that coin, was the opportunity to talk to the Vendors in the Exhibit all. I did take advantage of that. I had a couple of specific things I wanted to learn more about, and I did get that and was able to talk specifically to a couple of vendors who were very interested in the discussions. I took advantage of that discussion time, and missed a couple of classes that I had scheduled myself to attend. This may only be me, but I didn’t see the User to Developer discussions, out in the open, that I had expected to see. That may be only my perception. The issue here was there wasn’t enough time between sessions. You have 15 minutes to change “classes”. If I was on the 1st floor, and the class was on the 3rd, it was very difficult to get there in time. The flights of stairs were very long, and very few elevators. Sorry, I am not as young as I used to be. The ‘networking’ was the most important part of this trip for me. That is the time to meet and talk to people, in person, that I know through the Genea-Bloggers. I missed classes to do this, and to spend time with a couple of the Vendors. The change that I would like to see is a more formal time for Users to speak with Developers. There were times to do that in the Exhibit Hall, but that was too noisy at times. I might call it a huddle room discussion area, where a vendor would be able to be in part of a class room, where users could sit around and chat. It wouldn’t have to be everyone, but an opportunity for small groups to sit around an chat. Dialog like: Here is what we are thinking about doing…. What would you like for us to do …. Here is something that I would like to see your product to do … I am trying to solve this problem …. Discussion areas, in addition to the presentation areas. 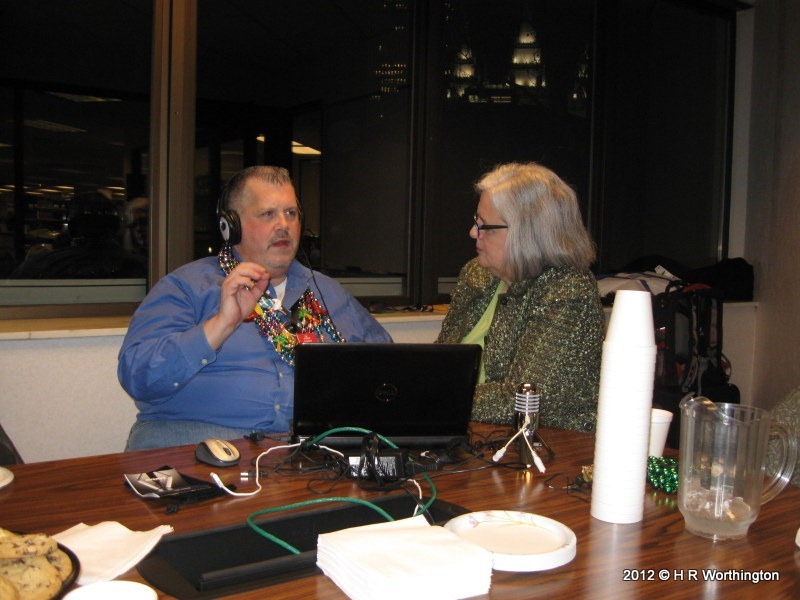 A Great place to meet other genealogists and to be presented with the future of our hobby (obsession). 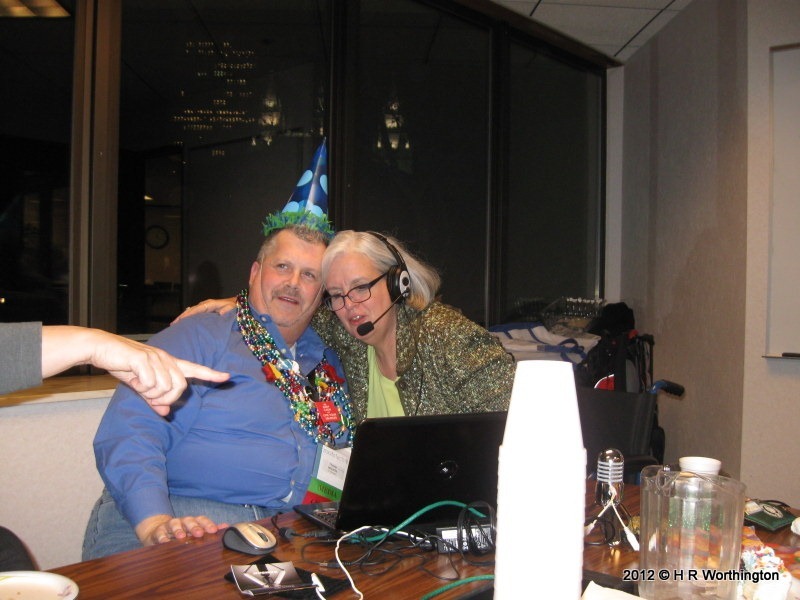 While at Roots Tech 2012, the GeneaBloggers Talk Radio celebrated it’s first anniversary. Thomas MacEntee and Dear MYRTLE getting ready for the show. A little closer to show time with the mike that didn’t work. This was a 1 minute and 47 seconds before the show when we had to make some technical changes. They’re ready to go live. 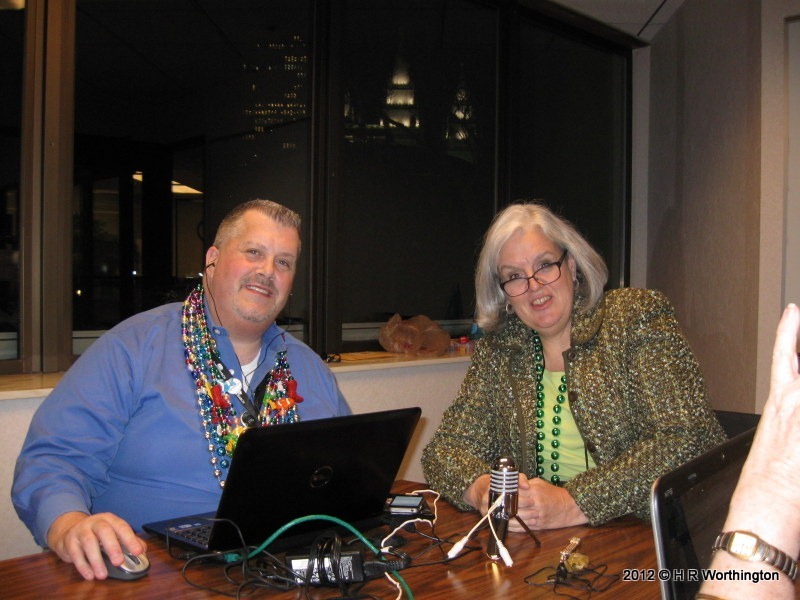 The Flip-Pal guests, Diane Miller and Walt Grady. The headset that Thomas has on was switched between the two of them several times during the hour show. 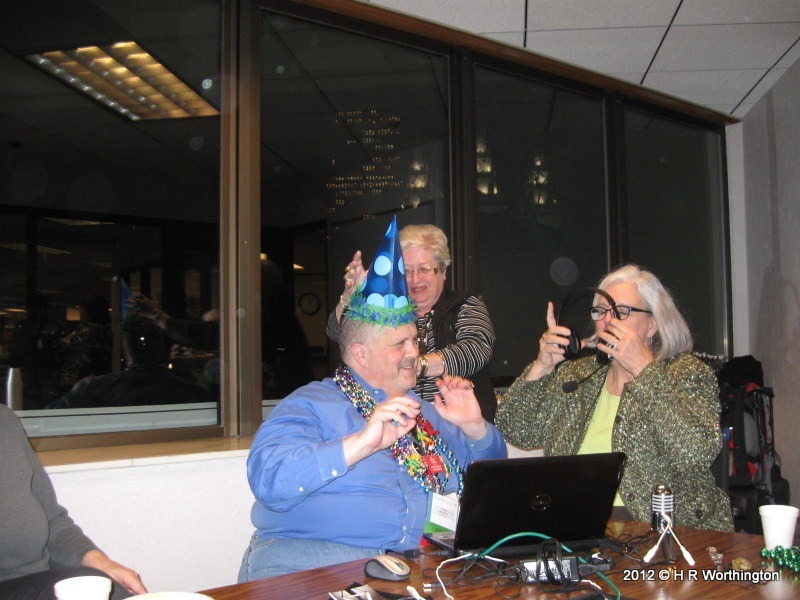 Another headset switch while GeneaBlogger Jill Ball places the hat on Thomas. 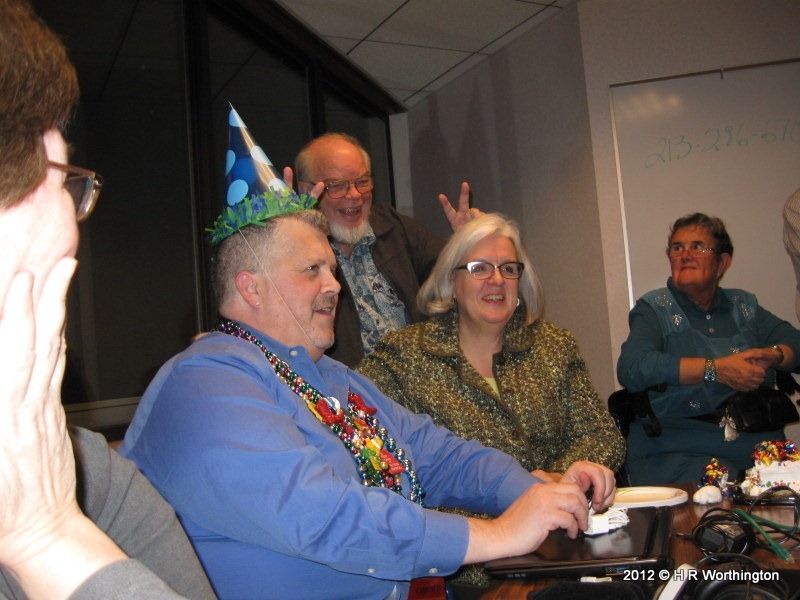 Thomas MacEntee, Dear MYRTLE, Angel Linda and Randy Seaver, having some fun. Just posting an update for my adventure to Roots Tech 2012. In a word, exhausting. Over the next couple of days, I’ll share some of my experience at Roots Tech 2012. Almost on information overload, very tired, but very refreshed. Catching up with folks that I have met along the way and meeting new people in person, that I have met in the world of Social Media. I didn’t have a lot of a “Must Do” list, but there were a couple of specific things that I wanted ‘answers’ to, and people I wanted to meet. I think I met those goals. But most of all the opportunity to meet the many GeneaBloggers in attendance. I can’t say that I met all of the GeneaBloggers, but it was close. Several speakers that I have heard recently say that it’s a great time to be doing Family Research and from what we heard at Roots Tech this past weekend, it’s going to get even better. It will take a couple of days to digest and post my experience. DearMYRTLE has a “Name that Gadget Contest”. Should be the name of this NEW Gadget. The new Gadget should be called “Say Hello”. Ever think of just calling someone with your Smart Phone? Just got back from dinner with 6 Genea-Bloggers, part of the 90+ Unofficial Genea-Bloggers at Roots Tech 2012. We all got checked in, had a warm up of the Genea-Blogger BUMP, spend time meeting each other, sharing stories. Were all hungry so we went out for food. One of the first Genea-Bloggers that I really wanted to met was the footnoteMavin (fM, sometimes referred to on FaceBook). She encouraged me to create, and actually helped me name my Headstone Collection Blog. Well, what an honor to meet her in person. We were chit-chatting at dinner, when she asked a question: Why does the US have so few Genealogy Magazines, while the UK had quite a number (16, is what I remember her mentioning)? 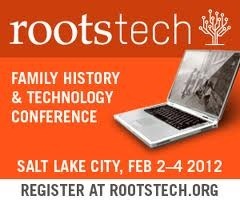 Interesting question for a bunch of seasoned and not so seasoned Genea-Bloggers waiting for RootsTech 2012 to start. Pause a moment – I am not staying down town. My choice of hotel was not a good one, but it will work, but it involved a 20 minute train ride. My quick response to fM’s question was – we are in too much of a hurry. As there were a couple of folks who had been to England, had family in England mentioned the difference between how we get from one place to another. The train ride back to the hotel was a great example of what we were talking about. SmartPhone, hand held devices, things hanging out of one’s ears were all on the train but one person. That one person, actually had a book. No one on the train when I went down town had a book. The electronic devices were being used by everyone (but me, I hadn’t ridden that train before, had no clue where I was, only hints on where I wanted to get off of the train). The England observation was that everyone was reading a book or a magazine. Thinking of how many of us get to and from work, it is mostly by automobile vs train. Of the 35 years that I worked, 33 of those years the commute was by car. No books or magazines there. The 2 other years, I did ride a train, but my Laptop was running for 2 hours on the train, getting work done. Probably that last 10 years that I drove to get to and from work, I did have books, but they were Books on Tape. (now CD). So, for me, one of the reasons for the lack of Genealogy Magazines is due to how we get to and from work. We are in cars and not trains. Next, has to be how busy we all are. Even being retired, I rarely will sit down and read a book or a magazine. Having said the, I will also admit that I am not a reader to begin with, but others may have the same experience. Guess you can’t read and drive a car at the same time. (we’ll not talk about Jersey drivers here. Next, what did everyone at the diner table have, and referred to a couple of time, Electronic Devices. If “it”, in this case a magazine, isn’t on the hand held device some readers won’t read. It was great to see my oldest granddaughter show me her kindle last night to show me how many books she had read and was lined up to read. I am guess that a number of Magazine Readers are reading information on these hand held devices. The train ride to and from Salt Lake City reflected this non-scientific study. Still not a good reason for not having Genealogy Magazines here in the US. But wait, we are getting ready for Roots Tech 2012, right. Has technology for family researchers / family historians changed how we learn information that might have been in those magazines? I wonder. I can only tell of my experience. I have learned most of what I know about doing Family Research, not from Magazines, but from those options that have been available to me over the past 15 years. I learned so much information on the Train by listening to Genealogy PodCasts. DearMYRTLE, Lisa Louise Cook, the GenealogGuys, just to mention a few. Learning on the train, was so much easier my listening to the podcast, then it would have been to read a magazine. OK, not riding the train, but still not reading Magazines, now it’s Google Reader for the 2,000+ Genea-Bloggers that are around. Several hundred blog posts a day, they are free, they come to me, I read what I want, I have the option to go to the Blog post, have the option to post a comment on that blog post, skip over those blog posts that may not be of interest at the moment. But, many time, I have gone back to a Blog to read an earlier message that I remembered that I wanted to re-read. If I am done with a magazine, it’s out the door. The Blog Post remains. Having said that, I have ripped pages our of Magazines, to read later, or I want to hold on to this for later, but I never get back to them. With Blogs, however, I can usually get back to That Blog Post that had what I am looking for now, when I need it. So, for me, the “magazines” that I used to subscribe to, are now information that is available online, AND in many cases, been updated based on current technology. Finally, where is your local newsstand where you could buy a Genealogy Magazine. The US magazines that we mentioned were sold, in many cases, by the local newsstand / book store, that doesn’t exist any longer. Those stores that sell magazines at all, aren’t going to sell a Genealogy Magazine, at least where I live. I used to have one, 30 minutes drive away, but it’s closed. The Technology that we have today, the way we travel, our busy schedules, the availability of Genealogy Articles, written by the best, are not sold on a newsstand, and only a few are available by a subscription. I have a subscription to ONE printed genealogy magazine. At this point if others were available, I am not sure that I would send the money for a physical magazine to come to my mail box. Rambling thoughts based on a question “around” an unofficial Genea-Blogger’s dinner table. Any thoughts or comments? I’ll pass them along to fM. Clothes are packed, techie stuff gathered, emails and blog post caught up, now to try to get some sleep. After staying home but watching all of the events, and blog posts from RootsTech 2011, I decided that I wasn’t going to miss the 2012 event. I signed up as soon as we were able to register. It’s almost an overwhelming event. But, I have had a couple of warm up events. Wouldn’t have missed them either, but this is a “biggie” for me. Why go to such an event? I could answer that by saying “It’s in Utah”. That is true, but my granddaughters live there, does that count? So, this time tomorrow, I should be having dinner with them. Can’t wait. Why THIS event, specifically? Three reasons, I think. Not necessarily in that order. Not that I am a Techis person, but I have my toys. Been in on some leading edge techie stuff over the years, but a place where Genealogy and Technology gather in one place, sounds like where I’d like to spend three days. Certainly from everything from last year, there was no way to miss it this year. But the third item is the real reason for going. Over the past several years, I have met, talked to, read many blog posts from each of the Official List of Genea-Bloggers, and most of the 90+ Genea-Bloggers that will be there in their blog posts. I will NOT be able to connect Genea-Blogger to Blog, but I have checked, and I don’t think that I don’t follow any of the Bloggers that will be there. But, the Genea-Bloggers is a community of wonderful people. 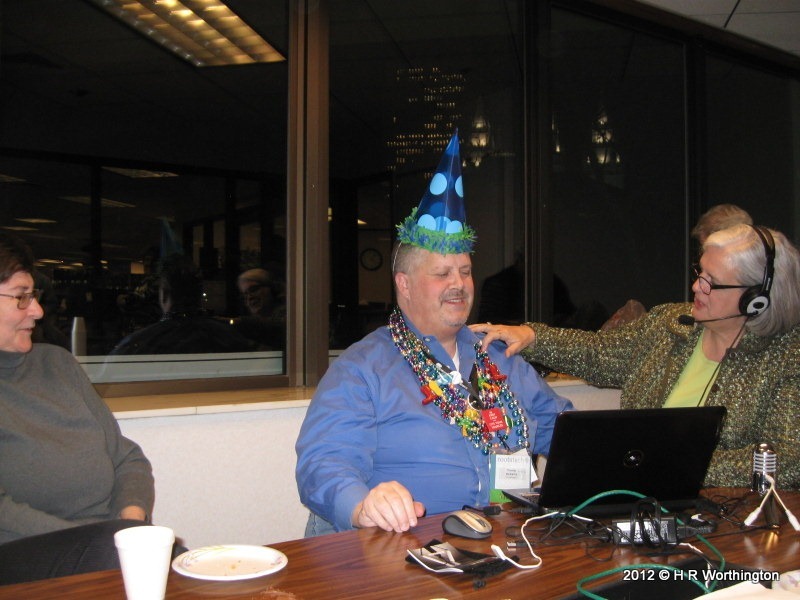 For example, a group gathers for Genea-Blogger Talk Radio on Friday nights. Who listens to Radio ??? It’s not the AM / FM / Stereo Radio, but a Talk show, none the less, Show Host Thomas MacEntee lines of topic specific shows each week for about an hour and a half. While we listen to the “radio” there is a very active Chat going on, while the show is progressing. A couple of shows, there have been over 100 people in the Chat Room. It’s those folk, and the Bloggers that I am hoping to meet, hang out with, go to class with, but to Learn FROM. 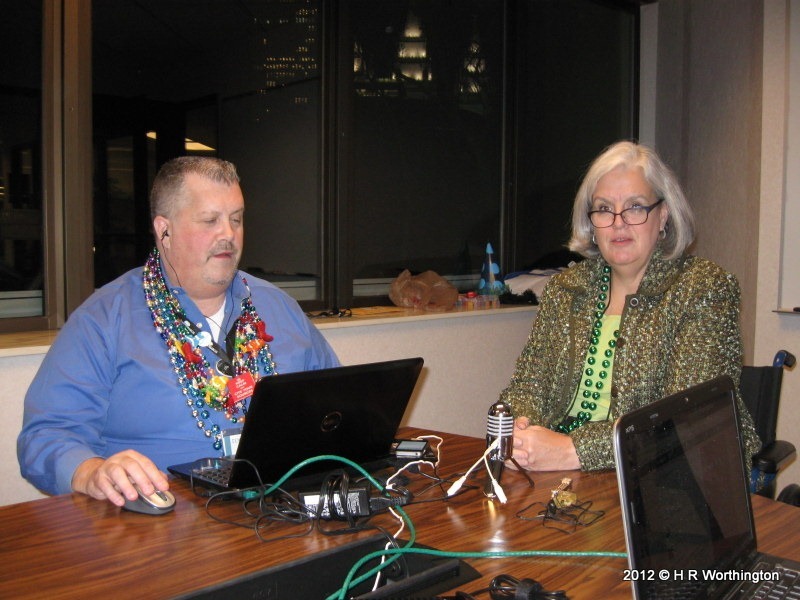 As I understand it, Genea-Blogger Talk Radio will be Live from the Family History Center in SLC. Guess where I will be. But wait, isn’t that the opening of Season 3 of Who Do You Think You Are? 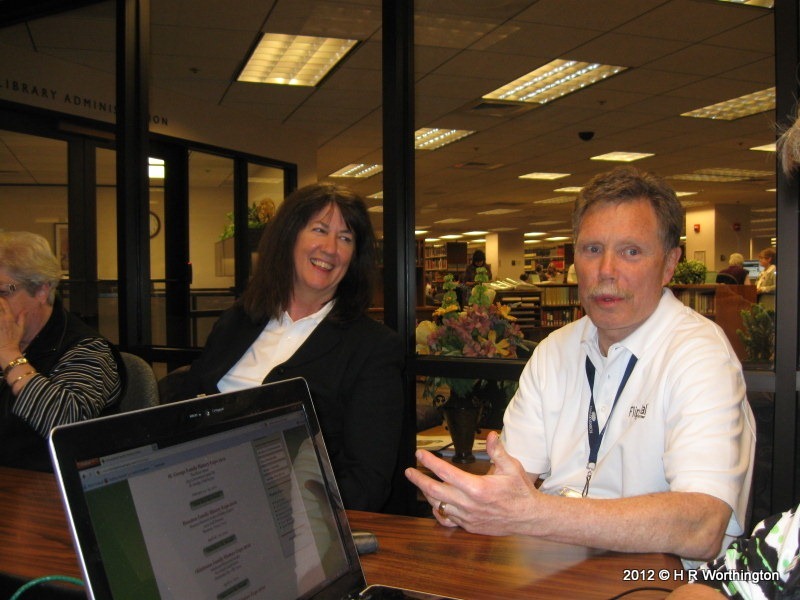 What a better place to be, then at the Family History Library in Salt Lake City. I have to say, that I have been there twice before. Totally overwhelmed by what is there. But this time, I will have follow and learn from others. I know I should have a goal for a visit to the FHL, but I don’t. I will have my research on my iPad, the ability to take notes, take pictures, just in case I find what I am not looking for. Will post as I am able.